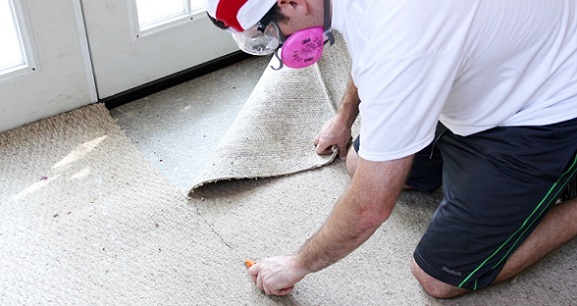 We can also provide tear out of the carpeting at your residential or business location. You may not want to pay a contractor $1000 a day to drink coffee for 3 days until the carpet in your home is torn out and piled in the driveway for pickup. Our carpet tear out experts can rip up your carpet and padding in minutes for alot less than you would have to pay a local contractor. The rug tear out prices start at just $95.00 per room (up to 120 square feet) and that includes removal of the tac strip that hold the carpet down. You may have beautifil hardwood floors underneath that old stained carpeting. Once the rug has been removed, revealing whatever floor lies beneath, it will be time to haul away the torn out carpet to the dump for disposal. We can help you with that part 7 days a week for the lowest prices in Santa Rosa and the surroudning area. The discount carpet removal service we provide is available in Petaluma, Sebastopol, Windsor, Rohnert Park, Cotati, Forestville, and Graton, CA. 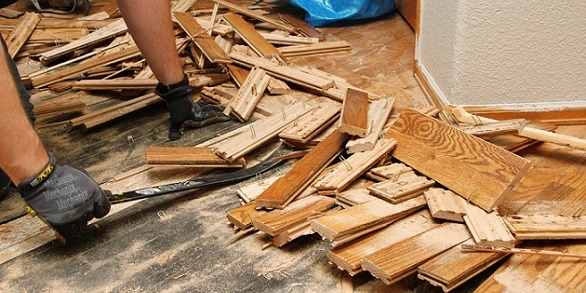 If your remodeling and installing new floors the old rug that was or will be ripped out can be picked up by our construction debris removal crew for as little as $49.00! Call (707) 922-5654 for a free quote on pick up and disposal of your old carpet and carpet pad today. Removing the carpet in your home is actually pretty easy, (aside from the tac strip). Just start at one corner of your room and yank up a the very corner of the rug. Once you can get ahold of the carpeting, the rug will peel right back. Fold the carpet in half over the room so your looking at the bottom of the rug. The bottom can be cut into 6ft long strips with a sharp razor knife. If the strips are too long cut them in half so your only rolling up about 8-10 ft x 6ft piece at a time. Now the rolls of carpet can be carried outside into the driveway or yard for pickup and recycling by our carpet recycling crew. Did we just say "Recycling of Carpet"? There is no such thing right? Wrong! They actually recycle carpet right here at Global Materials in Santa Rosa. It still costs the same to dump carpet and carpet pad, which is currently around $120.00 per ton. However, the rugs and carpet rolls we take away for disposal are off loaded in a special section of the dump on Santa Rosa Ave. Once thier used carpet pile gets about as big as a small apartment, they send over the tractor and load up semi trucks full of the textiles, carpet rolls, and used carpet padding to be trucked off to a textile recycler in Oakland, CA. The Sonoma County dump at Meacham Rd. in Petaluma does not separate and recycle old carpet. Since we are commited to providing 100% green junk hauling service, we make sure every carpet load goes to the Santa Rosa dump location so it can be recycled. Carpet disposal service for the Santa Rosa area is easy to order anytime 7 days a week. Just call us at (707) 922-5654 or email us online and you can book pickup and disposal of your ripped out carpet for the next day! In some cases the carpeting rolls that are littering your front yard can be removed the same day! We can also remove other remodel debris that your construction or home improvement project may have generated. Demolition of residential walls and flooring can quickly build up a pile of debris such as wood, drywall, used lumber, and concrete. Removal of contruction debris is our speciality. We love removing big or small piles of rubbish no matter what it is. Laminate flooring, linoliem floor, plywood sub-floor, or that annoying particle board underlayment can all be picked up 7 days a week by our Santa Rosa based junk hauling company. Call for a free quote on rubbish removal at your home or business. We are ready to haul away whatever you need gone. What happens top my used carpeting once it's removed from my property for disposal? With most companies used carpet is dumped in the local landfill and you never see it again. When we remove carpet = it gets recycled! Carpet recycling service is something that is releatively new. They only just figured out how to recycle textiles a few years ago. In 2001 the EPA met with the MOU and they pledged to divert 40% of all postconsumer carpeting that ends up in landfills by 2012. The MOU established the Carpet America Recover Effort (C.A.R.E.) to accomodate carpet recycling for individuals and business owners around the country. 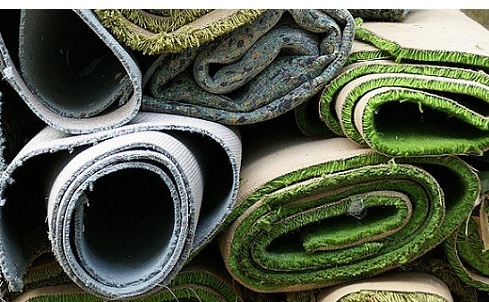 There are about 60 facilities around the United States that can pick up and haul away old carpeting and recycle it. We are fortunate to have one such facility close to us here in Sonoma County. When carpeting is recycled it's first scanned to determine it's polymer content and then seperated accouding to it's makeup. The top fluffy carpet fibers are shaved off to be woven into recycled yarn. The rest of the material is then shipped off to other companies where it's recycled into nylon plastic for use in automative parts. The recycling process for carpet can turn 30 million pounds of carpet into 9 million pounds of nylon. That recycling proccess earned its inventors an Energy Globe Award in 2008. Call 7 days a week for a FREE quote on haul away of anything from random household junk to yard waste, large item pickup, appliance recycling, mattress disposal, couch removal, garbage removal, and recycling of e-waste or household electronics, and anything else you want to get rid of. Price is for a big pickup truck stacked to roof with old carpet & pad in Santa Rosa, Rohnert Park, Cotati, and Winsdor CA. At the same time your carpet flooring is being ripped up your contractor may also be doing demolition of walls or bulding new walls and have lumber scraps left over. 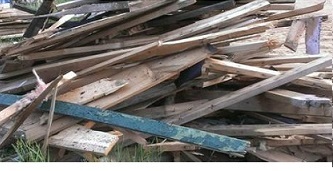 We are able to recycle 100% of all the scrap wood and used lumber we haul away. Construction site clean up big or small usually has wood in it. If your contractor can stack the old studs and wood waste in a seperate pile form the garbage, it will make removal of your lumber pile quick and easy once we come to pick it up. We recycle wood, plywood, OSB, wood furniture, wooden fence boards, dressers and wood furniture, and anything made of wood. It doesn't matter if it's painted or full of nails and screws! We can still recycle it here in Santa Rosa. The concrete patio has seen better days and it's time to demo it and put something new in your yard. Dipsosal of broken concrete is something we have been doing since 2001. We are experienced in picking up and moving concrete and cement that comes from all sorts of places. 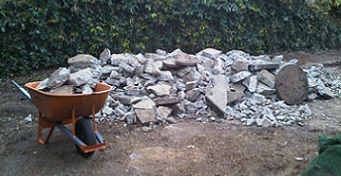 We provide hauling of foundation repair debris, driveway or sidewalk demolition, or just concrete that ended up on your property and your not quite sure where it came from. We can haul away cement even if it has rebar and wood mixed in. The concrete, rock, and brick we remove does get 100% recycled at the Stony Point Rock Quarry on Stony Point Rd. or at Wheeler Zamaroni on Petaluma Hill Rd. in Santa Rosa, CA. They will crush your old concrete into base rock and sell it back to us.. The next buliding you see go up in Santa Rosa may be sitting on base rock made from your old patio! We don't just offer removal of construction debris. A large part of our furniture hauling consists of couches and beds that need to be hauled off to the dump. We know how to carry your unwanted sofa out of your home without damaging the walls. That is because our furniture disposal company has removed over 1000 pieces of furniture in the last 12 years. Since 2001 we have offered low cost mattress pickup and sofa removal in Santa Rosa, Petaluma, Rohnert Park, Sebastopol, Cotati, Forestville, Graton, Kenwood, Glen Ellen, and Windsor, CA. Recycling an appliance such a washing machine or clothes dryer in Sonoma County can be also done with a phone call to (707) 922-5654. or book junk pickup service online by clicking here. Furniture donation is tricky but we can find a local charity that will accept your couch or mattress for donation. Click here for a list of charity organizations that offer free pickup of donatable items in the Santa Rosa area. If the Salvation Army or other local chairty is going to take too long or won't accept some of your items, we will be ready to remove anything left over. Just point to the items you want gone and our capable junk haulers we do the rest! Time for new flooring in your home or office? Now low cost carpet removal and hauling service is available 7 days a week in Santa Rosa and all of Sonoma County. Since 2001 we have been providing carpet disposal service in Petaluma, Sebastopol, Rohnert Park, Cotati, Forestville, and Windsor, CA. Remodeling can be a big deal, we can make at least the construction debris haul away part of it quick, easy, and worry free. One call to our carpet removal specialists and you can have your demolished flooring picked up and disposed of responsibly by our green junk hauling service. Based in Santa Rosa, we are a localy owned and operated debris removal service that recycles over 75% of all the rubbish and trash we are called on to haul away! Remodel debris like hardwood floors, linolium flooring, carpet and carpet padding, broken up particle board flooring, and other construction waste can all be recycled at nearby Santa Rosa recycling facilities. You may have one small area rug that has spills on it or you may need removal of carpet that covered your whole house. Half a pickup load with carpet padding is not a problem for Sonoma County Waste Disposal Service. We do small dump runs as well as huge hauling jobs. We can haul up to 20 yards of rubbish in our biggest dump truck.